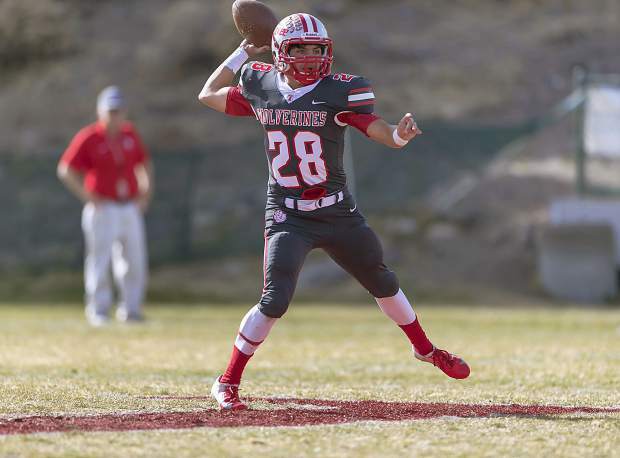 Truckee quarterback Marcus Bellon was named Class 3A co-MVP for his play this past season. After two of the best seasons in program history, Truckee quarterback Marcus Bellon and linebacker Drew Wingard have been named the best in Class 3A. Bellon has been named Class 3A co-Most Valuable Player, along with Churchill County senior running back Sean McCormick; while Wingard capped off his career at Truckee as the Class 3A defensive player of the year. Bellon was also named co-MVP of the Class 3A Northern League earlier in the fall. The two-year starter led Truckee in multiple facets this past season, guiding the Wolverines to their first state championship game since 2012. Bellon finished his season by completing 115 of 192 pass attempts for 1,905 yards and 21 touchdowns. He was also Truckee’s third leading rusher with 491 yards and a team-high 10 touchdowns, and caught five passes for 69 yards and a pair of touchdowns. One of his many highlights this season came in a game against Dayton where Bellon threw for a touchdown, ran for a touchdown and caught a touchdown. Bellon was also used on special teams, and proved to be a dangerous return man, scoring twice on punt returns and once on a kick return. He was Truckee’s punter too, averaging 33.1 yards per punt. Defensively, Bellon finished with one interception and 24 tackles. Bellon’s MVP award is the first by a Truckee player since 2010, when quarterback Ben Bolton won the honor. Wingard’s defensive player of the year comes after being named the Northern League’s top defender. The Truckee senior finished his season as the Class 3A leader in tackles with 134, which was fourth for all of the Nevada Interscholastic Activities Association, regardless of class. Wingard finished the season with 20 tackles for a loss, two fumble recoveries for touchdowns, five forced fumbles, a blocked punt and 3.5 sacks. Truckee senior Marcus Trotter proved he was among the best players in the state regardless of position, accomplishing the rare feat of landing on first-team all state lists for offense and defense for his play at running back and defensive lineman. Trotter was also first-team all league on both offense and defense, finishing the year with 586 rushing yards and seven touchdowns. Trotter also caught 14 passes for 324 yards and two touchdowns. Defensively, he was sixth in Class 3A with 6.5 sacks. Trotter also posted 76 tackles, including a team-high 25 tackles for a loss. Senior offensive lineman Ryland Ward earned first-team all state honors. Ward finished the season with six pancake blocks in plowing the way for of the top rushing attacks in the state. Defensively, senior Jackson Skaff earned first-team all state honors for his play at linebacker. Skaff had 113 tackles last season. He also intercepted a pass, forced a fumble and had two fumble recoveries. Two of the members of Truckee’s secondary landed on the first-team all state list. Senior Derek Laferriere was third on the team with 97 tackles this season and also intercepted a pair of passes to earn first-team honors. Junior Tyler Estabrook also was named first-team all state after finishing the year with two interceptions, a blocked punt and a blocked field goal. Senior kicker Emmanuel Valenzuela-Jones was named first-team all state as well. Valenzuela-Jones converted four of eight field goal attempts, including a 44-yard kick for his longest of the year. He also knocked in 57 of 63 extra-point attempts, and had 22 touchbacks on kickoffs. Truckee’s nine players with player of the year or first-team all state honors is the most the teams has had since winning the state championship in 2012, according to Head Coach Josh Ivens. Truckee senior tight end Brennen Conklin was named second-team all state. Conklin caught 12 passes for 251 yards and four touchdowns for the team this past season. Senior offensive lineman Jake Bullion finished the year with 13 pancake blocks to also earn second-team all state honors.